*The schedule is subject to change. Please check the Status Page for regular updates. This is a full platform AND Agent release, therefore, partners should expect very brief disconnects of the Agent during the update window. The new ConnectWise integration component is available from the ComStore. From the Setup > ConnectWise tab, users can configure the ConnectWise integration using the REST API credentials from ConnectWise. Refer to Configure account synchronization. Upon completion, the ticketing integration can be configured, and the default Service Board, Ticket Status, Ticket Type, Ticket Sub Type, and Ticket Priorities can be defined from there. Refer to Configure ticket synchronization. Users can then map Datto RMM devices to ConnectWise configurations. One or more devices can be newly created or mapped to existing configurations. 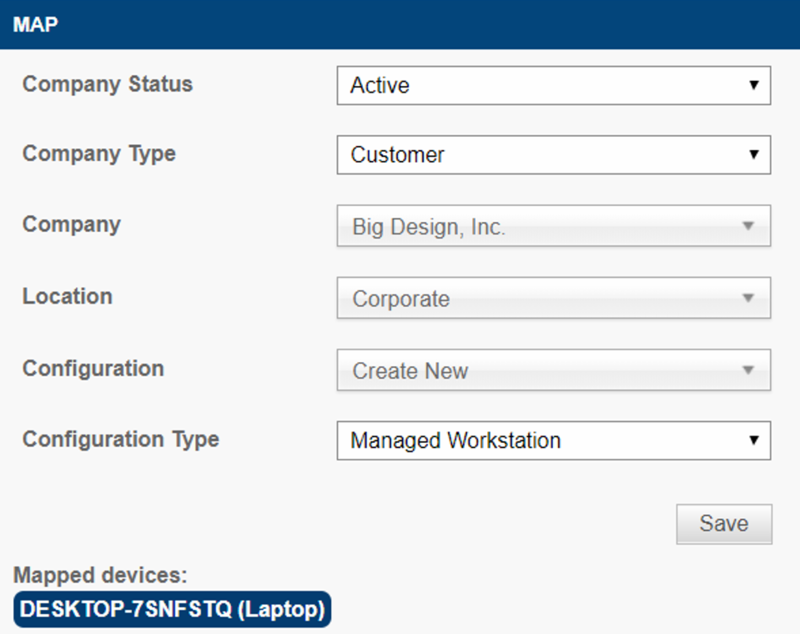 Users can select the Company, Location, and Configuration Type for devices. Refer to Map RMM devices to ConnectWise configurations. Mapped/created Datto RMM devices will exist in ConnectWise under Configurations for the selected company. From there, users can see the Device Name, Type, Status, Manufacturer, Model Number, and Serial number. Users can also go to the device directly by clicking the Manage Device button in ConnectWise. Refer to Manage RMM devices. Monitors and monitoring policies that have the New Ticket box checked will automatically create tickets in ConnectWise. Alternatively, users can also manually create a ticket from Datto RMM alerts by clicking the New Ticket button. Tickets will be created in the defined Service Board and automatically linked with the correct configuration and company. Round-trip ticketing works automatically: when tickets are closed, the corresponding alert will be closed as well. Users can directly open the ConnectWise ticket from the alert and the alerts list by clicking on the ticket number. Refer to Round-trip ticketing. A sneak peek at the new ConnectWise Integration. New feature RMM-633 A new Export to CSV option is available on the Users page to export a list of all users and their attributes in a single CSV file. Refer to Users. Improvement RMM-1042 To make tickets easier to read, we’ve removed the text “AEM Monitor Alert” that was previously listed in every ticket title. Refer to PSA alert ticket information and notes. Improvement RMM-526 For new security roles, PowerShell permissions in the Agent Browser tools are automatically set to ON. Refer to Security Level Details - Agent Browser Tools. Improvement RMM-630 The Use Account Level Agent Deployment Credentials option under Sites > [site name] > Settings > Agent Deployment Credentials is now enabled by default so that newly created sites use the most common option and do not require additional configuration. Refer to Agent Deployment Credentials. Fix RMM-754 We’ve fixed an issue where, when selecting specific devices for a new job on the Monitor Alerts page, all devices from the same site would also be selected. Fix RMM-594 When changing a device's Network Node settings from the Device Summary page, the platform now correctly re-calculates the Network Node's status monitors. Fix RMM-504 Users can now change the alert priority on the Antivirus Status Monitor. Improvement RMM-602 RDP now works in configurations where a Windows GPO setting enforced that RDP should always prompt for a password upon connection. Users are now prompted for an additional password as per the policy. Improvement RMM-182 We’ve implemented logic to validate the Agent GUID on the Agent to prevent issues for customers when they overwrite the Agent ID in the registry. Fix RMM-529 French translation for the Import button when importing a component has been updated to correctly describe the action. Fix RMM-528 French translation for the Override button when creating a new Account Patch Management policy has been updated to correctly describe the action.